The Toronto Blue Jays visit Target Field on Friday, September 15, 2017 to play the Minnesota Twins. The probable starters are J.A. Happ for the Blue Jays and Bartolo Colon for the Twins. The opening line for this matchup has Toronto at +100 and Minnesota at -110. The Blue Jays have a 65-74-7 over/under record and a 67-79-0 run line mark. The Twins are 77-68-0 against the run line and have a 66-70-9 over/under record. The Blue Jays have a 68-78 overall record this season. Starting pitcher J.A. Happ has a 8-10 record with an earned run average of 3.73 and a WHIP of 1.36. He has 122 strikeouts over his 125.1 innings pitched and he's given up 127 hits. He allows 9.1 hits per 9 innings and he has a FIP of 4. The bullpen has an earned run average of 4.22 and they have given up 489 base hits on the year. Teams are hitting .238 against the bullpen and they've struck out 575 hitters and walked 196 batters. As a team, Toronto allows 9 hits per nine innings while striking out 8.5 batters per nine innings. They are 15th in the league in team earned run average at 4.45. The Blue Jays pitchers collectively have given up 1,320 base hits and 650 earned runs. They have allowed 179 home runs this season, ranking them 14th in the league. Toronto as a pitching staff has walked 499 batters and struck out 1,244. They have walked 3.4 men per 9 innings while striking out 8.5 per 9. They have a team WHIP of 1.38 and their FIP as a unit is 4.27. As a team Toronto is hitting .242, good for 29th in the league. The Blue Jays hold a .412 team slugging percentage and an on-base percentage of .314, which is good for 26th in baseball. They rank 28th in MLB with 8.2 hits per game. Kevin Pillar is hitting .259 with an on-base percentage of .303. He has 139 hits this season in 537 at bats with 41 runs batted in. He has a slugging percentage of .410 and an OPS+ of 84. 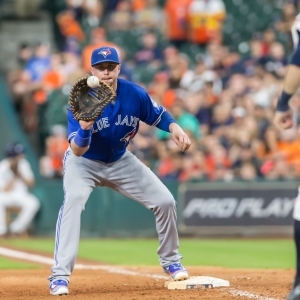 Justin Smoak is hitting .280 this year and he has an on-base percentage of .360. He has totaled 141 hits and he has driven in 86 men in 503 at bats. His OPS+ is 134 while his slugging percentage is at .553. The Blue Jays have 1,196 hits, including 239 doubles and 198 home runs. Toronto has walked 490 times so far this season and they have struck out 1,169 times as a unit. They have left 972 men on base and have a team OPS of .726. They score 4.27 runs per contest and have scored a total of 619 runs this year. Minnesota has a 76-69 overall mark this year. With an earned run average of 6.41, Bartolo Colon has a 6-12 record and a 1.62 WHIP. He has 80 strikeouts over the 126.1 innings he's pitched. He's also given up 174 hits. He allows 12.4 hits per nine innings and his FIP stands at 5.01. The bullpen has an earned run average of 4.54 and they have given up 506 base hits on the year. Teams are hitting .260 against the Twins bullpen. Their relievers have struck out 419 batters and walked 166 opposing hitters. As a team, Minnesota allows 9.4 hits per nine innings while striking out 7.2 batters per nine innings. They are 22nd in the league in team earned run average at 4.67. The Twins pitchers as a team have surrendered 1,334 base knocks and 662 earned runs this season. They have given up 200 home runs this year, which ranks 7th in Major League Baseball. Minnesota as a staff has walked 432 hitters and struck out 1,028 batters. They give up a walk 3 times per 9 innings while they strike out 7.2 per 9. Their team WHIP is 1.38 while their FIP as a staff is 4.74. As a team, they are batting .259, good for 13th in the league. The Twins hold a .435 team slugging percentage and an on-base percentage of .335, which is good for 7th in baseball. They rank 13th in MLB with 8.9 hits per contest. Eddie Rosario comes into this matchup batting .290 with an OBP of .327. He has 138 hits this year along with 67 RBI in 476 AB's. He maintains a slugging percentage of .498 with an OPS+ of 116. Brian Dozier is hitting .261 this season and he has an OBP of .348. He has collected 145 hits in 556 at bats while driving in 83 runs. He has an OPS+ of 119 and a slugging percentage of .484. The Twins as a unit have 1,278 base hits, including 255 doubles and 184 homers. Minnesota has walked 538 times this year and they have struck out on 1,182 occasions. They have had 1,027 men left on base and have an OPS of .770. They have scored 5.01 runs per game and totaled 721 runs this season.